The Groom’s Cake is a long-standing wedding tradition that has evolved quite a bit over the last 300 years. Its history is a bit sketchy (some say pieces were at one time sent home with all the single female guests, who would place their slice under their pillows and dream of their future husbands), but most agree that the groom’s cake was to be offered to guests as an alternative flavor to the traditionally white Bride’s Cake (commonly known today as the wedding cake). White cake and white frosting on the Bride’s Cake came to represent her purity – just like her white wedding gown. However, brides today do not feel bound entirely to white attire and certainly aren’t afraid of adding a splash of color to their wedding cakes. Likewise, the modern-day Groom’s Cake (originally quite plain in appearance so as not to upstage the “real” wedding cake) has evolved into another way for couples to uniquely express their personalities. 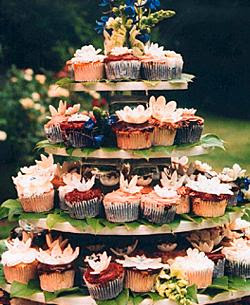 A groom can choose his own cake, or the bride can choose his cake as a surprise to be eaten at either the rehearsal meal or the wedding reception. A Groom’s Cake can reflect his hobbies, career, or personality – and many are just as elaborate as the “actual” wedding cake itself. Check out a few of these options offered by Cake Affairs. Owned by two sisters, Cake Affairs prides themselves on a fantastic attention to detail. These cakes definitely have the “Wow” Factor – more than once I found myself staring intently at the screen thinking “Seriously? That’s a cake? !” For more inspiration, visit their website to see their full gallery – and don’t forget to check out the fabulous selection of Bride’s Cakes as well! I'm not a fan of cake. I don't know why. By all accounts, I'm genetically predisposed to be a cake-lover. My mom and sister truly love no other food more than a beautifully decorated, 5-tier, white wedding cake. Ugh. As I child I would usually request ice cream cake, cheesecake or pies when my birthday rolled around, so I always knew I wouldn't serve a traditional wedding cake at my reception. What I did not know was that my Prince Charming would love cake and be mortified at the very thought of ditching it for a tasty alternative. Our compromise? A 4-tiered cake offering a different flavor in each layer (amaretto, strawberry swirl, chocolate mousse, and tiramisu). So, yes, in the end I did end up with a (gorgeous!) cake at my reception. But it was fun and different - and guests loved having 3 options to choose from. Only 3, you ask? Yup! Hubby and I took the top tier (tiramisu) home and had it for dessert every night for the first week of our married life. I couldn't bring myself to freeze it and eat it a year later when I knew it would be so yummy NOW! Can't bring yourself to pick just one? Set up a buffet table! Guests are sure to appreciate the variety and creativity. Plus, if you do some research, you'll spend less on a buffet than a big cake. Decorate the table with lavish flower arrangements and tiered serving trays to really make the presentation pop! Best of all, your big day will certainly standout from all the rest! 1. No topper at all. Does your cake already include ribbons, pearls, and elaborate embellishments? Less is more. Consider leaving the topper off altogether. Just as you need to balance your own accessories (do you really need the veil, tiara, rhinestone clip and baby roses in your hair? ), you need to keep an eye on your cake decor. Know when to leave well enough alone! Choose from gold or silver to accent your reception decorations – some even offer color rhinestones. Clear, acrylic monogram letters offer the clean look of an ice sculpture. Still not your style? Have your cake designer create a monogram out of candy! If a monogram seems to crowd the top of the cake, just use the first letter of your new last name (or the first letters of both of your first names if you're keeping your maiden name). 3. Flowers. Fresh or high-quality silk, it doesn't really matter – just be sure it doesn't look cheap. If you're having an outdoor reception in the summertime, you might consider silk so they don't wilt in the heat. Decorate your wedding cake with the same flowers you carried in your bouquet or match them to the color scheme of your reception. 4. Your wedding date. In a style similar to that of the monogrammed cake toppers, immortalize your wedding date (“9.09.09”) in all those face-stuffing cake shots your photographer is sure to get. 5. Something that shows your unique personality as a couple. Did you meet in the military? At church? Do you share a love of music or sports? Rest assured, a Google search will turn up the perfect wedding cake topper to showcase your unique interests or talents. Many cake topper designers are now catering to the unique personalities of couples with religious, hobby, and vocational themed cake toppers.